Like any craftman I want people to get acquainted with my knives that's why I decide to organize pass around, there will be two knives with different grind of blides. The knives are already in the USA at Marc and he'll take them to famous event that starts on 29 April on eastern coast. This event will be the beginning of our pass around, the second participant may take the knives there. The terms are usual, I'll quote Rick, hope he won't be angry. The usual rules apply - keep it a week, sharpen it only if you know what you’re doing, insure it when shipping to the next person on the list. 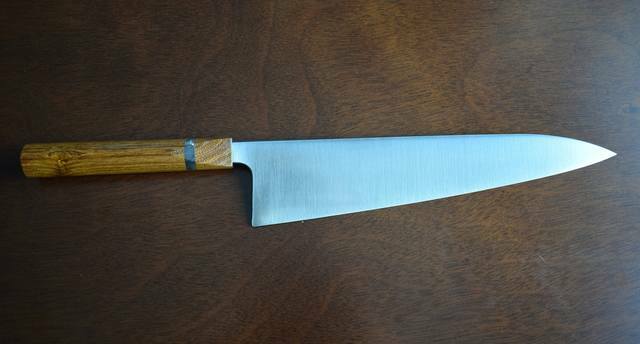 Post in this thread when you get the knife and when you send it to the next person. I would appreciate any comments or criticism, and you may post about your experience in this thread. I will also be bringing my very recently acquired example to the ECG. Though it's not a "passaround," anyone attending is welcome to admire -- and even try -- it (even though I haven't done so yet). I've had a chance to play with both of these. 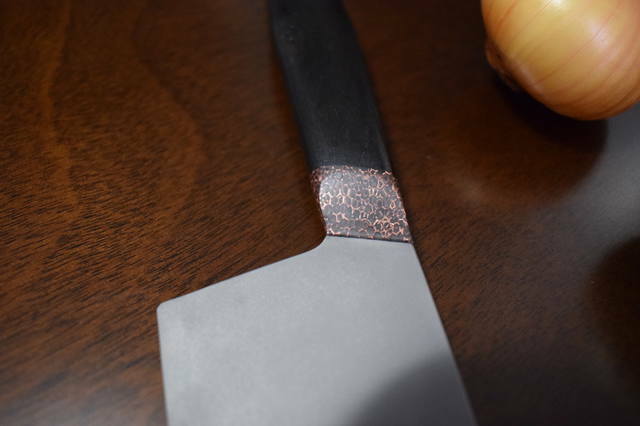 One of my chef's really enjoyed the bottom one (dark handle). Both knives are quite fun. I suspect these will get well used come Sunday. I also hope that my knives will get a little attention. I will be glad to your opinion. I would be in, but have my own on the way. I can post a review once I play with it for a bit. These knives spent some quality time on the cutting board at the ECG today. Hopefully some of the testers will chime in over the next day or two with their thoughts. Both of these knives are now with @toddnmd. They both definitely garnered a lot of attention, along with the ones that Larry @larrybard, Rick @Pensacolatiger and myself purchased. Anyone interested in trying out these two knives should get a hold of Andrei. I highly recommend trying Andrei's work out. You'll be pleasantly surprised. Plus with Andrei's current pricing his work is impossible to beat! I think the list for who gets these next is pretty open. Please post here if you would be interested in joining this passaround. I can ship off to whoever is closest to me for the next turn. 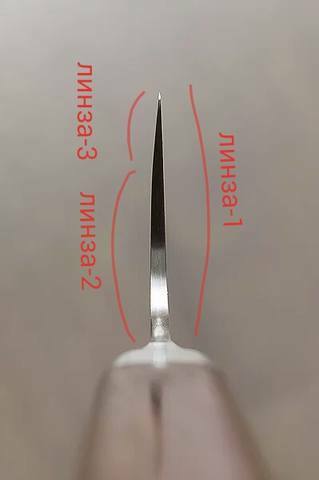 Andrei, could you give a little more info about these two knives? Steels used, grinds, finish, etc. I would most certainly be interested in taking a test drive! A little later I'll write the description of these knives, and I'm glad that it has become more people wishing to try them. I'd love a chance to compare these two to the one I have. Please add me to the list. Blade: 52100 60-62HRC 260/58 / 5mm. 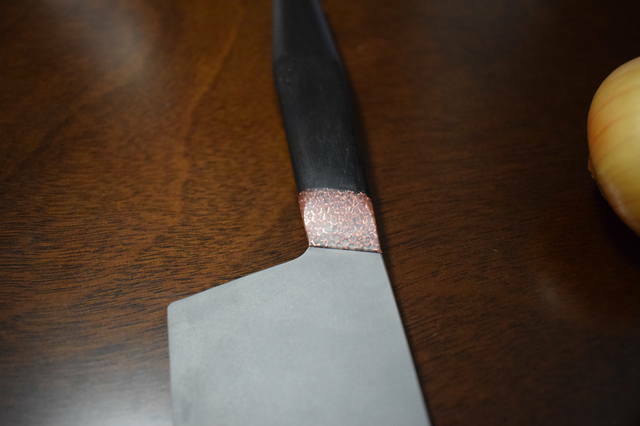 The second knife has a handle from African ebony and copper foam in acrylic, acrylic changes color when heated. Blade: 230/52/2.5mm. Steel, analog 440c 60-61HRC, blade coating sandblast. 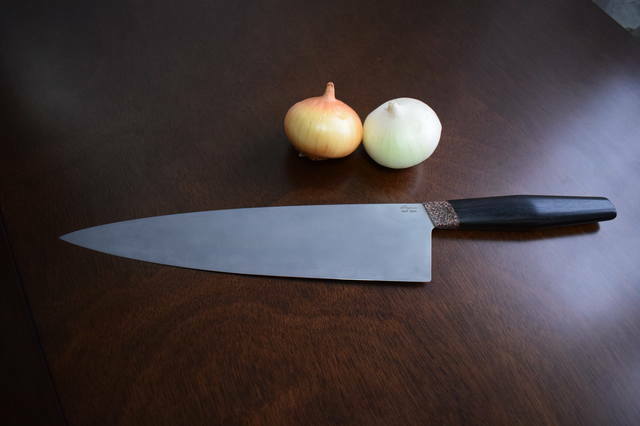 The knife has a profile. Outstanding........ my curiosity is peeked. Not sure who is next. PM me your physical address, please. Should ship out middle of next week. Whom ever is next........ you are in for a real experience. Detailed review on both knives to follow. According to Andrei's list, I'm next, but only if they've been to Marc and Todd.